A study published in the January 2019 issue of Health Affairs found that health care spending for six out of seven conditions over a 20-year time period was both cost-effective and a source of high value creation. The study, conducted by researchers at the National Pharmaceutical Council and RTI Health Solutions, was designed to assess whether increased medical intervention spending on prevalent conditions has been a good investment over time. 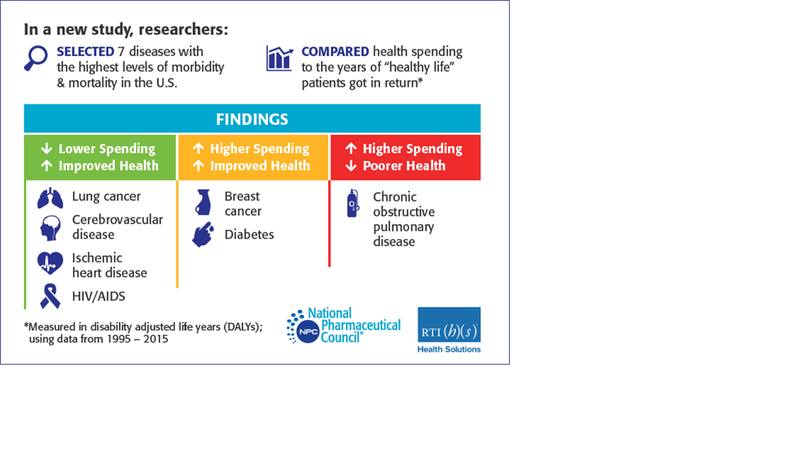 Researchers examined spending for prevalent chronic conditions from 1995-2015 to determine the estimated changes in the cost and burden of disease (in terms of morbidity and mortality). The top causes of mortality and morbidity were identified as ischemic heart disease, cancer of the trachea, bronchus, or lung, breast cancer, HIV, cerebrovascular disease, chronic obstructive pulmonary disease (COPD), and diabetes. Using data on spending and outcomes for each condition, condition-specific cost effectiveness ratios were calculated by dividing the per person difference in costs between 2015 and 1995 by the per-person difference in disability-adjusted life years. Increased prevalence and Inflation account for the majority of cost growth over 20 years, underscoring the need to adjust for changes in both disease prevalence and inflation in assessments of health care costs. Spending increases have been a significant source of value creation for top diseases associated with disability and mortality. In six out of the seven conditions that were analyzed, increased health care spending led to improved patient outcomes. Furthermore, in four of these conditions, increased investment led to decreased per-patient costs over the 20-year study period. A disease-specific approach to cost management is needed. For some diseases, additional spending is both cost-effective and a source of high value creation. Future cost-management strategies should incorporate a disease-specific approach to target areas where increased spending is associated with fewer benefits.